Bun Bo Hue is spicy rice noodle soup. Ingredients: rice noodles, beef, lemon grass, shrimp paste. 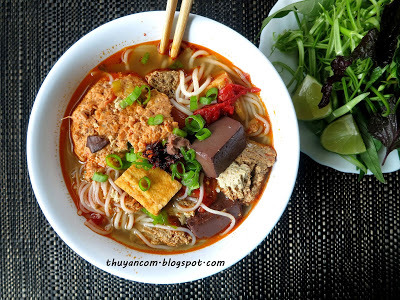 Bun Rieu is tomato crab noodle soup. Bun Suong is spicy rice noodle soup, served with shrimp sausages, slices of cooked pork belly, cilantro sprigs, diced scallions, and chili sauce. The broth is cooked from pork bone, chicken, shrimp stock, dried shrimp, tamarind, and onion. Pho noodle soup is served in a bowl with a specific cut of white rice noodles in clear beef broth, with slim cuts of beef (steak, fatty flank, lean flank, brisket). Banh Canh Cua is crab noodle soup with thick rice noodles, like Udon . Mi Quang is “yellow turmeric noodles, covered with vibrant orange shell-on shrimps, fatty thin slices of pork belly, big chunks of spared ribs, fried fish paste, sesame rice crackers, roasted peanuts, fresh herbs, shredded banana blossom ” (Source from The Spice of Life).